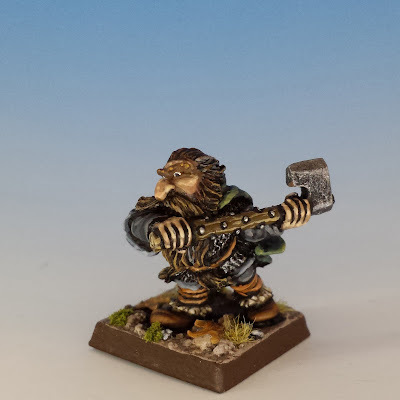 Thanks to everyone who left so many thoughtful comments about my post on Jewish characters in fantasy settings generally (and in Citadel miniatures in particular). Although this was a pretty obscure topic, to my surprise, it turned into one of the most popular posts I've ever written. There's much to say as a follow-up, but I'm going to limit myself to three quick points. “I didn’t intend it, but when you’ve got these people on your hands, you’ve got to make them different, haven’t you? The dwarves of course are quite obviously, wouldn’t you say that in many ways they remind you of the Jews? Their words are Semitic, obviously, constructed to be Semitic." One particularly important connection between Dwarves and Jews is the theme of exile. Medieval Jews were defined by their banishment from Israel. And when we encounter the Dwarves in The Hobbit, we also meet them as exiles. Nobles, warriors and great craftsmen are reduced to wandering like tinkers, singing mournfully about their lost home in the Lonely Mountain. But when we come into The Lord of the Rings, we understand that there is a much greater and more painful exile troubling the dwarves: the long banishment from Moria. 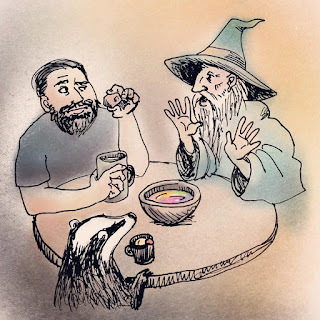 By seeing the connection between Dwarvish and Jewish history, we can better appreciate the motivations of a character like Gimli, and his keening for Moria. This connection is also important because it adds another layer of poignancy to the friendship of Gimli and Legolas. I sense in their reconciliation a hidden hope of Tolkien that centuries of strife and mistrust -- in both Europe and in Middle-earth -- can be amended in the wake of horrific war. As K. Friedman says, they ain't making Jews like Jesus anymore. 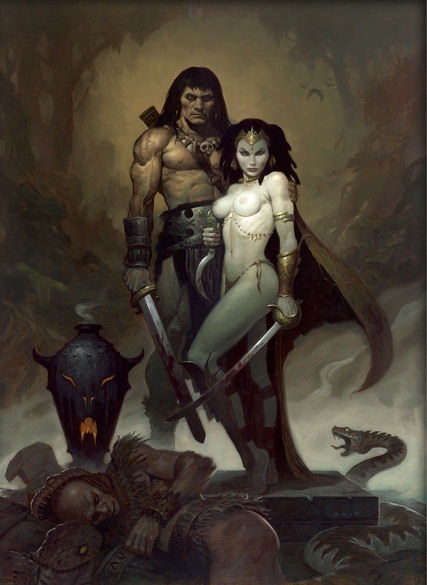 The second thing that surprised me about the commentary on my post was that nobody mentioned the Land of Shem invented by Robert E. Howard in his Conan stories. Howard's Hyborean Age has many thinly veiled parallels with our ancient world, notably the association of the Shemites with the ancient Israelites. "Shem" is, after all, the son of Noah who was the legendary progenitor of the Hebrews, Assyrians and others. Howard himself wrote that his ancient Shemites would become our "Arabs, Israelites, and other straighter-featured Semites." (The Hyborean Age, 1936). Straight-featured Semites? Is that a thing? That'll put steel in your thews. Finally, I don't want to leave the topic of Jews in fantasy worlds without mentioning Hello from the Magic Tavern. This is a podcast that's broadcast from a tavern called "The Vermillion Minotaur" in the magical land of Foon. The podcast does an excellent job of poking fun at many of the conventions of high fantasy, including the customary absence of Jews. 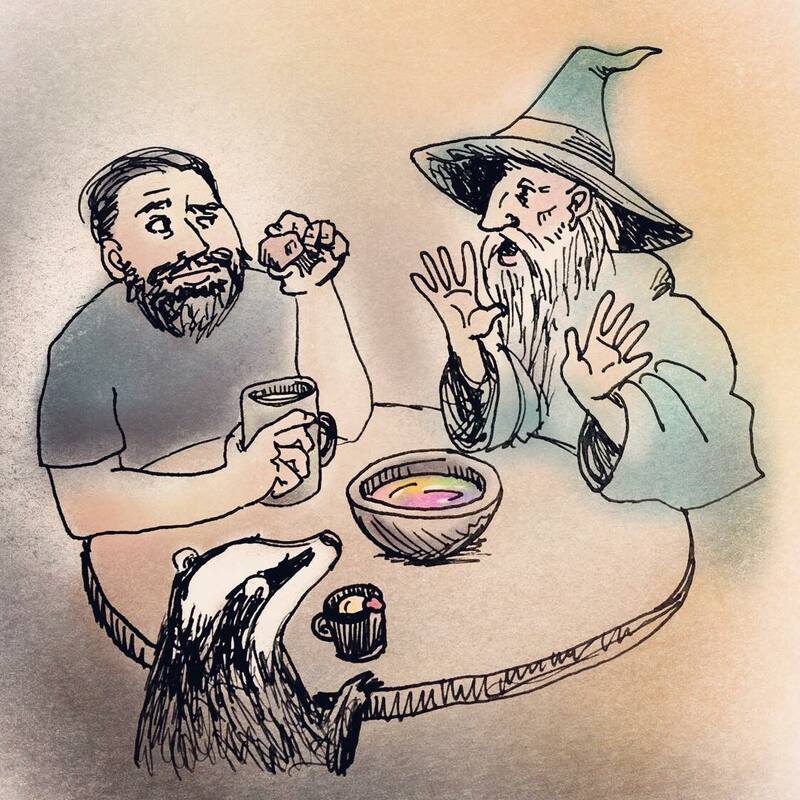 If you haven't listened to Hello from the Magic Tavern, give yourself a treat and start at Episode #1. Or, you can fast forward to Episode #45 and listen to an interview with the First Jew of Foon. Just remember --- IT IS NOT REAL. Interesting and thoughtful post again. I started at episode one of the podcast and enjoyed it. Hey... followed to here from post in reddit. Just FYI, another character is Jewish women being slutty and mysterious. This is a common attitude towards most minority women, especially in the past. So you got a sort of Jewish pirate women... who is naturally more attracted the protagonist than to her own race. Thanks for this informative post. I had never thought of Dwarves this way, but I can see why Tolkien would have made them an echo of Disapora Judaism. It does make sense. I am glad I never heard of Belit when I was an adolescent. It would have had my hormones in overdrive, and my bosom, of course, heaving. As always your writing is concise, insightful and most importantly entertaining. I've neglected your blog for far too long!